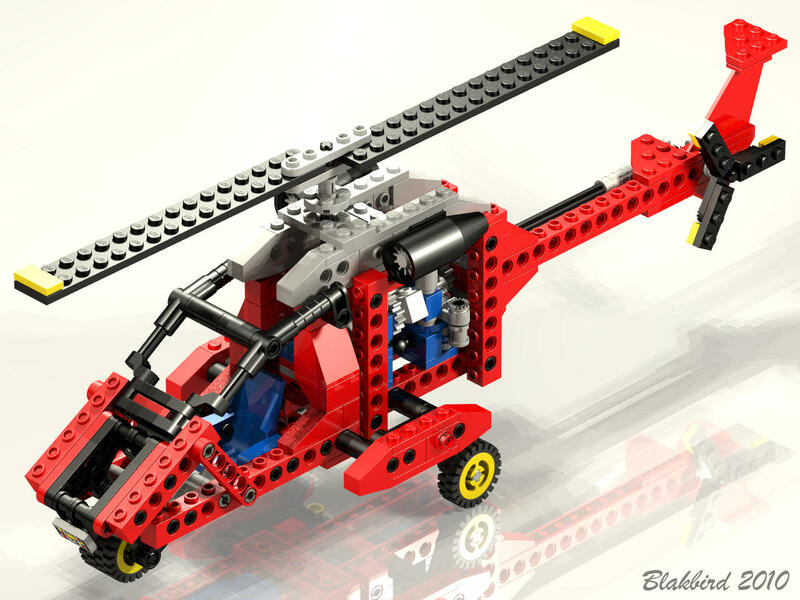 There are a whole lot of helicopters in the Technic line, and although Chopper Force is only medium sized, it has some of the best play features of any of them. The main and tail rotors are operated by a lever which can be pushed with the same hand that holds the helictopter, allowing simulated flight. 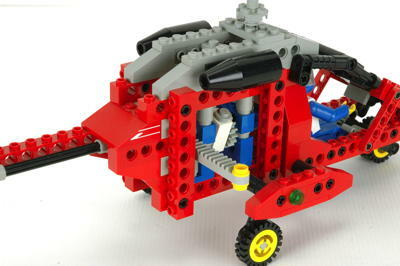 Other helicopters typically use a crank on the side which requires another hand. 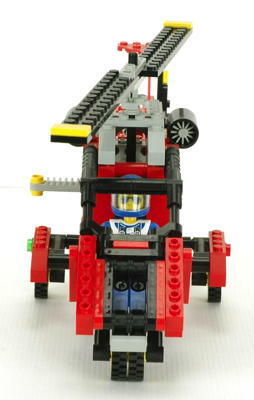 In terms of appearance this model is unremarkable, although it is somewhat unusual in that it includes a Technic figure pilot. 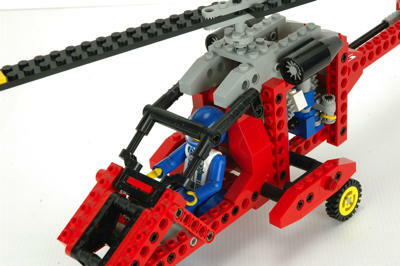 The 2-bladed main rotor and 3-bladed tail rotor are geared together and operated by a ratcheting linear lever on the side of the helicopter. 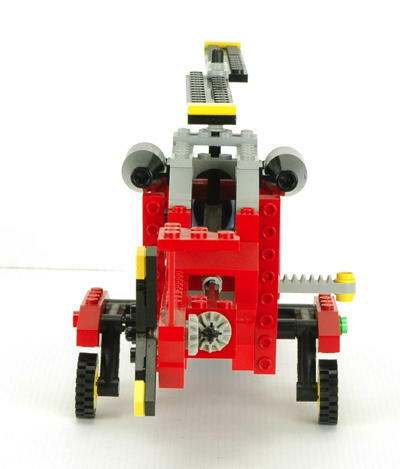 This lever has a high gear ratio which rotates the rotors quickly when pushed. 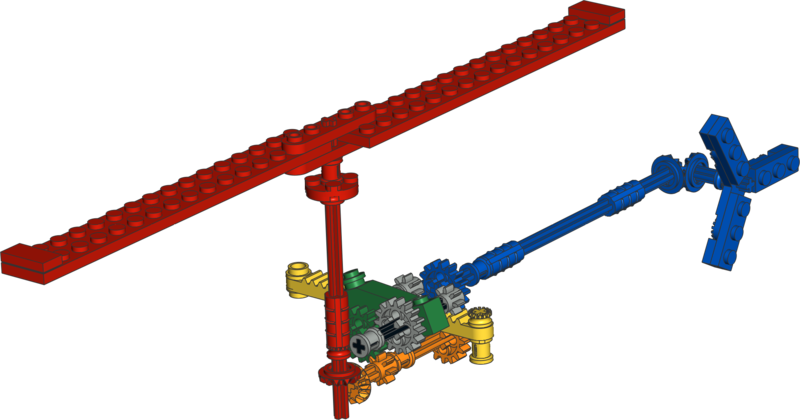 When it reaches the end of its travel, a ratchet system allows the rotor to keep spinning while a rubber band returns the lever to the starting position to push again. The computer image shows how it works. The yellow rack gear is the lever and it drives the gray 8 tooth pinion. The pinion axle is also a pivot point for the green ratchet. 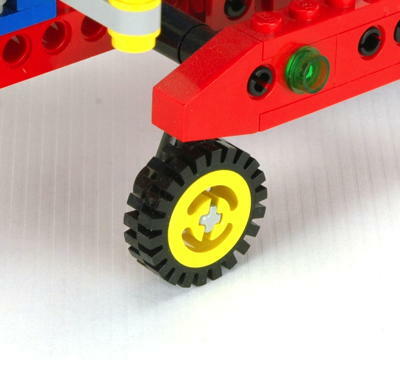 When driving forward, gear tooth forces and gravity force the green gear down against the orange gear and drive the rotors. 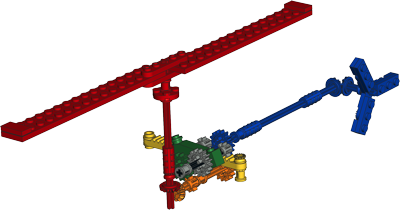 When the lever is stopped, the inertia of the rotor causes it to keep spinning while the green gear floats and skips above the orange. The system works perfectly. The animation does a respectable job of showing it. The canopy is constructed from the new angle connectors and opens manually. 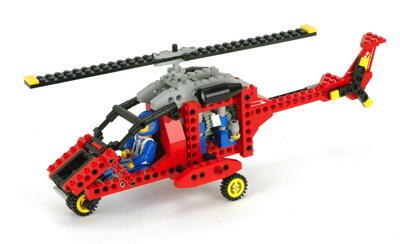 Flying a helicopter takes a great deal of coordination. Rather than subject helicopter pilots to complicated aptitude tests, regulatory authorities just make them do sweet dance moves as shown. 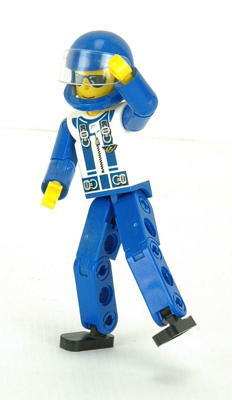 This Technic figure is unique to this set, although with the exception of the helmet he is the same as the figure in 8222.